When life is going well. When life is going in the way we think it should. We see our life as something beautiful! In short, anything but something beautiful. A few weeks back, as I read a post, called God Sees Through the Chaos, by Cheryl Zelenka, at Facing Trials, I was struck by how she told the story of how what we see as a mess actually being something beautiful. “I do so love the testimony of Corrie ten Boom and how her ministry of love and forgiveness continued on until her death. This story blessed me and I hope it blesses you as well. Triumphantly she flipped the cloth over and revealed an elaborately embroidered crown – symbolizing our crown of eternal life. The crown was intricately stitched, and had threads of many colors, including gold, silver and pearls. So much confidence, so much assurance and security can be achieved by having a plan that is in case of emergency. all help to provide such confidence, assurance and security. What about prayer? Is it your in case of emergency plan? 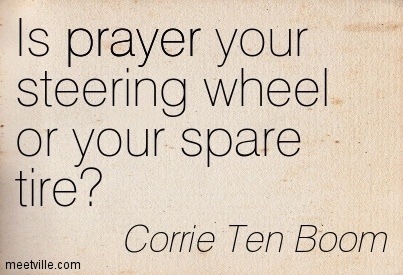 Cheryl Zelenka, in her post, Is Prayer Your Spare Tire, would seem to think that prayer should be our steering wheel, not our spare tire, always on hand in case of emergency. “Is prayer your steering wheel or your spare tire? So what did Corrie ten Boom mean when she wrote these words? While you are in prayer, do you take time to listen for instructions? One of the ingredients to prayer is listening to the voice of God. By listening during your prayer time, you will find guidance given by the Holy Spirit. Directions will be sent your way so that you can navigate and steer your spiritual wheel in the way God wants you to go. Now if prayer is your spare tire, it probably means you pray ONLY when you get a flat and need God’s assistance. Making petitions of God is never a bad idea. He will always listen to sincere prayers of repentance and requests for help. Lovingly, He will direct you out of your trouble. However, wouldn’t it be better to learn ways to avoid repeated pitfalls or flat tires? This requires a listening heart and an agreement to not only hear His instructions, but to receive them with an intent to carry them out.